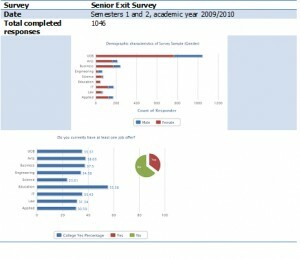 During the 2009/2010 academic year the surveys were implemented in the AIMS online system and were made available to all academic programs at UOB. While the first two surveys are conducted centrally by the QAAC, the third and fourth surveys are conducted by individual departments for their programs. All surveys are conducted on a web-based system and ensure privacy and security of the responders. Furthermore, the system allows the QAOs and the departments to get the data for analysis and offers a summary of the results, as well as reports for tracking the survey responders. QAAC obtained a decision from the University Council, making the Senior-exit Survey mandatory for all graduating seniors in their final semester. 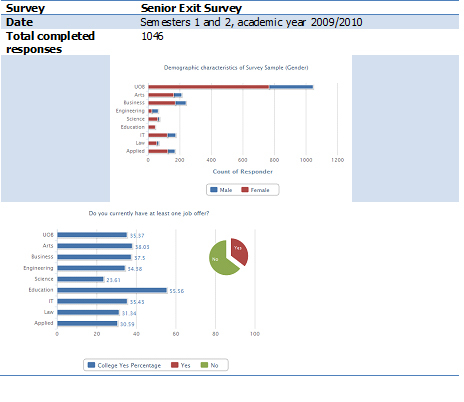 The following is a summary of the senior-exit survey that was implemented in the academic year 2009/2010.